The groomers at All About Dogs see Doodles (“Doodle” is a fun name given to Poodle mixes), almost on a daily basis. With their fun loving personalities, it’s no wonder Doodles have found their way into many homes. A great family dog, a Doodles need for constant grooming can sometimes be more then people realize. 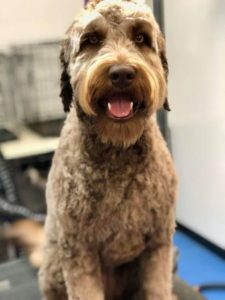 Lucky for us, AAD groomers, Julianna and Nina, have teamed up to help answer some of the common grooming questions when it comes to keeping Doodles looking their best! Are Doodle coats all the same? NO! Both groomers agreed, Doodle coats all vary. Curly, wavy, soft, coarse, they’re all different. Because they’re a mixed breed, coat texture varies greatly as does the length and how much they shed. Yes, they shed, some more then others. What’s the most common issue you have while grooming a Doodle? Julianna: Trying to get the smoothest cut possible. As stated above, their coats can vary. Sometimes the more softer, thicker coats, can be more difficult if the dog has some knots. Nina: Mats. Especially mat under the arm pits and on the belly area. Owners always want their dogs hair long, but they don’t brush them enough. How often should a person have their Doodle groomed? Julianna: It depends. If the owner can keep up with brushing, the dog can go a little longer. But in general, I suggest they come in to be groomed around every 5-6 weeks. Nina: Every 4-6 weeks. I recommend 6-weeks if they’re kept short and routinely brushed. If kept long, a bath at least every 4-weeks and, again, brush them on a regular basis. 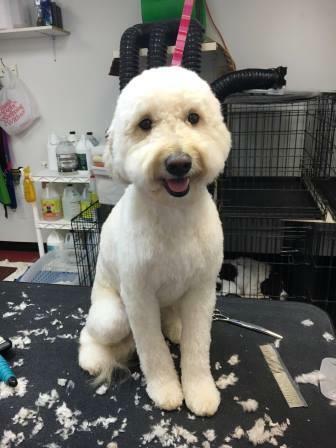 What can a Doodle owner do to keep their pup looking their best between grooms? Side Note: Any particular brushes/combs/shampoo/conditioner that you would recommend? Brush, brush, brush, brush and when you think that’s enough, brush some more. A good brushing goes a long way in keeping your Doodle looking fresh and it will help keep mats and knots from forming. If you don’t have time to brush your dog, a tight grooming schedule should be kept. Julianna: The best combs to use are Safari de-mat combs, Greyhound combs and then going over the dog with a slicker brush. Nina: I recommend using a 2 in 1 shampoo with conditioner on Doodles, and for conditioners in general my favorite is our TropiClean D-Mat. It washes out easily and helps break up mats for easier brushing. Are there any problem areas that owners should pay particularly close attention to when brushing? Their ears, tail, chest/neck areas, armpits, sanitary, inside of legs, under their chin, and oddly enough, between their toes. That’s quite a lot of area to cover, but by keeping up with brushing these spots you’ll help prevent matting and keep your dog comfortable in the long run. If owners find mats, what should they do? Mats can be extremely painful to your dog. If not tended to, mats can cut off blood supply and deny airflow to the skin which can cause health concerns. The longer haired the Doodle, the quicker mats can begin. Check your dog often and remember to brush, brush, brush! Julianna: If you find some mats on your dog, try your best to get them out with the combs I listed or make a grooming appointment. Do not cut them out with scissors. Nina: Brush them out to the best of your ability. If that’s not possible or they’re too close to the skin, contact your local groomer to have them shaved out. Aside from your typical Doodle groom, are there any unique grooms you’ve done on Doodles? Julianna: I’ve done a few Asian fusions and they are always fun to do! Nina: Depends on the owner. I always try to give them what they ask for! I personally like the “Teddy Bear” look – Fluffy head, short ears and fluffy legs. Any additional advice that you would like to share? Julianna: It’s always best to bring in your young puppies in to get them used to grooming so they know what the sights, sounds and different tools are. It will be less stressful for them as they grow and become more comfortable.